Background: The number of total ankle replacements (TARs) is rapidly increasing in consequence of the availability of new designs allowing to save the range of motion and to preserve against adjacent joints degeneration. This study aimed to compare participation in sports 12 months after TAR with either mobile-bearing or fix-bearing prosthesis. Materials and Methods: One hundred and seventeen primary TARs were performed (77 Hintegra, 40 Zimmer Trabecular Metal Total Ankle). We retrospectively assessed pain and function using the visual analogue scale (VAS) pain scale, American Orthopedic Foot and Ankle Society (AOFAS), Short-Form Health Survey (SF-12 divided into Mental (MCS) and Physical (PCS) score) obtained preoperatively, 6 and 12 months postoperatively. Activity levels were determined using the Halasi ankle activity scale and the University of California at Los Angeles (UCLA) score obtained preoperatively and 12 months after the surgery. Radiographic examination included plain radiographs with full weight-bearing taken preoperatively and 12 months postoperatively. Results: All patients showed a significant improvement for AOFAS, VAS, and SF-12 scores (P < 0.05). 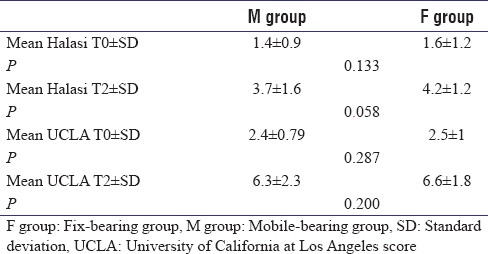 The Halasi activity scale and UCLA score were 4.2 ± 1.2 and 6.6 ± 1.8, respectively, for the fix-bearing group and 3.7 ± 1.5 and 6.3 ± 2.3 for the mobile-bearing 12 months after the surgery. In our series, jogging, dancing, and skiing represented the three most frequent sports. 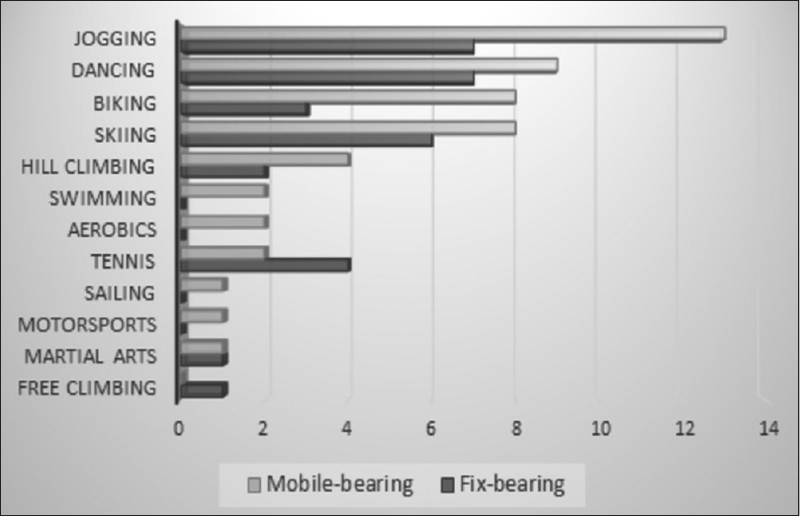 In the fix-bearing group, 60% of the patients practiced sport 1 year after surgery and 49.4% in the mobile-bearing group. The fix-bearing prosthesis had a quicker recovery and better functional outcomes within the first 6 months after the operation. At 1 year, there was not a significant difference in return to sport and physical activities between patients treated with a mobile-bearing implant and a fix-bearing implant. Conclusions: At 1 year, both fixed and mobile bearing present significant improvements in functional and recreational scores, with neither prove superior. Ankle osteoarthritis (OA) is a degenerative disease characterized by reduced quality of life and physical ability to accomplish occupational duties and sport and recreational activities in its end stage. Physical ability in patients with ankle OA is equivalent or even worse than that of patients with kidney or heart diseases.,, The number of total ankle replacements (TAR) being performed has been increased in the past decade in consequence of the availability of new implants design allowing to save the range of motion and to preserve against adjacent joints degeneration. At the same time, patients often request TAR not only for pain relief but also to maintain a satisfactory level of activity to participate in physical activities. There is little guidance in terms of physical and sport activities recommendations following this procedure. In fact, the opportunity of participation in sport and physical activities after TAR is controversial. Some studies have evaluated sports' activity levels after TAR,,,,, but there are no studies to date focusing on sport and activity levels in patients after mobile-bearing and fix-bearing ankle replacement and on the comparison between these implants. Considering the increasing requests for TAR from young and the active elderly, this study aimed  to record preoperative and postoperative participation in physical activities and sports and  to compare the ability of patients who underwent TAR with either mobile-bearing or fix-bearing design to return to sports and physical activities at a short-time follow-up. Between May 2011 and January 2015, 117 primary TARs were performed by the senior author in our institution. The 3-component uncemented Hintegra implant (Newdeal SA, Lyon, France) was used in 77 TARs through an anterior approach [Figure 1]. In June 2013, our group started using the 2-component uncemented Zimmer Trabecular Metal Total Ankle prosthesis (Zimmer, Warsaw, IN), which was implanted in 40 TARs through a lateral approach with fibular osteotomy [Figure 2]. In our series, we did not cement the implants: A sufficient stability was reached for each procedure and the osseointegration characteristics of the trabecular metal guarantee a stable and durable fixation. Each prosthesis was performed according to the manufacturer's standardized operative technique.,, The indications for the procedure included primary OA, systemic (rheumatoid) arthritis, and secondary OA (e.g., posttraumatic OA, hemophilia, hemochromatosis, gout, and postinfectious OA). Avascular necrosis of the talus involving >50% of the bone, neuromuscular disorders and neuropathic arthropathy, acute infectious arthritis, and pathologic joint laxity were contraindications. Patients who underwent revision surgery for failure of TAR were not included in this study. Our postoperative schedule consisted of a nonweight-bearing period of 4 weeks with a short-leg cast, and then, partial weight-bearing with a brace was allowed for 2 weeks. Full weight-bearing and a rehabilitation program (calf strengthening, proprioceptive training, and stretching of the triceps surae) were started 6 weeks postoperatively. Low-impact sports and activities such as swimming or cycling were also permitted. Full return to activity began at 3 months after surgery. The clinical evaluation was made preoperatively (T0) and postoperatively at 6 months (T1) and 1 year (T2). Pain and function were assessed with the 12-Item Short-Form Health Survey (SF-12), the American Orthopaedic Foot and Ankle Society (AOFAS) ankle and hindfoot score and the visual analogue scale (VAS) pain score.,,,, These scores were obtained preoperatively and at 6 and 12 months postoperatively. Activity levels were determined using the Halasi ankle activity scale and the University of California at Los Angeles (UCLA) score obtained preoperatively (T0) and 12 months after surgery (T2)., Halasi ankle activity scale is a ten-point scoring system in which several sports and physical activities are categorized in ten groups according to biomechanical load of the ankle. Three levels can be selected for each sport discipline ranging from the recreational level (exceeding 1 h/week) to the top level (professional or international elite). The UCLA score results from 10 descriptive activity levels: from dependent on others and inactive (level 1) to routine participation in impact sports (level 10). Matlab version 2008 (MathWorks, Natick, MA, USA) was used for the statistical analysis on 117 patients composed of 70 males (59.4%) and 47 females (40.2%) with an average of 53.3 ± 14.2 years (range, 22–79). The statistical tests used were ANOVA test and kappa test., For k-score, confidence intervals were defined at 95%. All statistical tests were considered significant with P < 0.05. A total of 117 TARs were included in the study, 59 right-sided (50.4%) and 58 left-sided (49.6%). The main indications for ankle replacement were posttraumatic arthritis (100 patients, 85.5%) and rheumatoid arthritis (six patients, 5.1%). In the mobile-bearing group, there was a statistically significant increase in a mean AOFAS hindfoot score between each control point compared to preoperative scores. In addition, there was a statistically significant decrease in the VAS pain score. Furthermore, there was a statistically significant improvement in the mean SF-12 [Table 1]. In the fix-bearing group, there was a statistically significant increase in mean AOFAS hindfoot score for each control point compared to preoperative scores. There was a statistically significant decrease in VAS pain and a statistically significant improvement in the mean SF-12 [Table 1]. 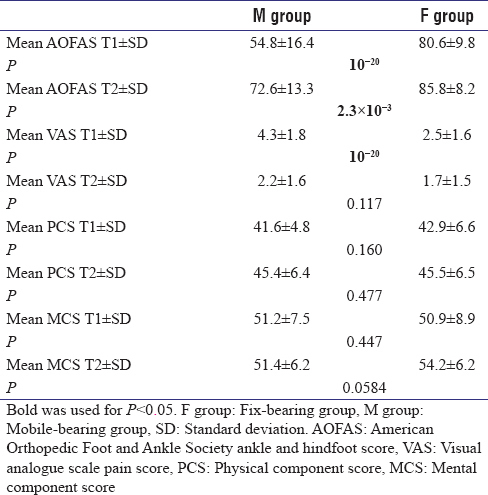 There was a statistically significant difference in the AOFAS hindfoot score between the two groups at T1 (P < 0.05) as well as for VAS pain score (P < 0.05). We found a statistically significant difference only in the AOFAS hindfoot score at T2 between the two groups (P < 0.05) [Table 2]. In the mobile-bearing group, there was a statistically significant increase in the Halasi ankle activity scale from 1.4 ± 0.9 at T0 (range, 0–4) to 3.7 ± 1.5 at T2 (range, 0–7) (P < 0.05). Moreover, there was a statistically significant increase in the UCLA score from 2.4 ± 0.8 at T0 (range, 1–5) to 6.3 ± 2.3 at T2 (range, 2–10; P < 0.05) [Table 3]. Preoperatively, 13 patients (16.9%) were active in sports in the mobile-bearing group and 38 (49.4%) were active in sports 12 months after surgery (P < 0.05). No patients arrested their sports activities; 25 (32.5%) patients, inactive before the procedure, restarted activities postoperatively. Among the physically-active participants, the patients were active in 0.2 ± 0.4 (range, 0–1) different sports disciplines preoperatively and in 1.4 ± 0.5 (range, 1–2) after surgery. In the fix-bearing group, there was a statistically significant increase in the Halasi ankle activity scale from 1.6 ± 1.2 at T0 (range, 0–6) to 4.2 ± 1.2 at T2 (range, 1–7) (P < 0.05). In addition, there was a statistically significant increase in the UCLA score from 2.5 ± 1.0 at T0 (range, 1–5) to 6.6 ± 1.8 at T2 (range, 3–10; P < 0.05) [Table 3]. In the fix-bearing group, 9 patients (22.5%) were active in sports preoperatively, and 24 (60%) were active in sports 12 months after surgery (P < 0.05). No patients arrested their sports activities; 15 patients (37.5%), inactive before the procedure, restarted activities postoperatively. Among the physically-active participants, the patients were active in 0.37 ± 0.56 (range, 0–2) different sports disciplines preoperatively and in 1.37 ± 0.48 (range, 1–2) after surgery. 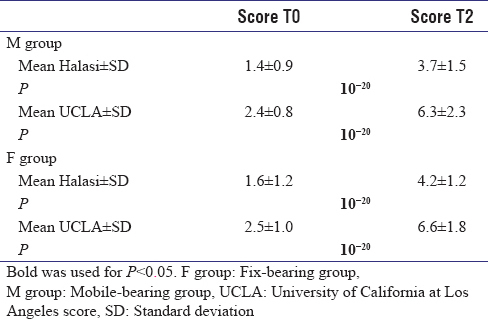 No statistically significant differences exist between mobile-bearing and fix-bearing group for both Halasi and UCLA scores at T0 and T2 [Table 4]. In the mobile-bearing group, the most common sports and recreational disciplines after the surgery were running (16.9%), dancing (11.7%), biking (10.4%), and skiing (10.4%). In fix-bearing, the most common sports and recreational disciplines were dancing (17.5%), running (17.5%), and skiing (15%) [Figure 3]. This is the first study that investigated and compared the rate of return to physical demanding activities after TAR with fixed or mobile bearing. Few studies have compared two- and three-component TAR types, but no studies have focused on return to physical and sports activities after these procedures. The long-term sequelae of ankle arthrodesis in terms of functional outcomes are debated.,, Biomechanical studies demonstrate that joint kinematics is more affected by fusion than TAR, even if it is still not clear if this can lead to a difference regarding the activities of daily life or the functional scores.,, Moreover, patients with combined ankle and subtalar or pantalar fusion have residual pain, increased energy expenditure, and decreased functional capacity , while TAR combined with subtalar or nearby joints fusion allows for preservation of ankle ROM and keeps a gait similar to the gait of unaffected patients. The number of TAR being performed is increasing, particularly in young active participants as a previous trauma is the most common etiology.,, In our experience, many patients ask to return to sports and physical activities; the surgeon's answer is still rather empirical and guided by common sense. To measure activity levels and to record participation in sports and physical activities, the ankle activity scale developed by Halasi was used. This score was originally used to assess patients with ligamentous injuries of the ankle, but it has already been used to record participation in recreational activities or sports in patients with ankle-related disorders. The UCLA scale has been already used to quantify activity levels in patients with ankle OA  even if it was developed to measure activity levels following hip arthroplasty. We believe that fix-bearing arthroplasty through a lateral approach allows one to restore physiological sagittal talar position intraoperatively in patients with anterior talar shifting, typical of posttraumatic OA, and leading to a quicker recovery. Moreover, the surgical approach may have influenced the results: Lateral transfibular approach allows a bone stock preservation, through reduced bone resections. Further potential advantages of the lateral approach include: Decreased risk of wound complications, thanks to a more respectful preservation of the distal leg and ankle angiosomes, leading to less vascular disruption, easier identification of the anatomic center of rotation and the possibility to address coronal plane deformities without substantial release, or reconstruction of the deltoid ligament. On the other hand, there are improvements in clinical and radiological outcomes 6 months after Hintegra total ankle arthroplasty together with a significant posterior shifting of the talus after the same period. This may be the result of the rebalancing of muscle and ligament forces after surgery and can probably justify the fact that, despite better functional scores (AOFAS hindfoot score and VAS) in the fix-bearing group after the first 6 months following the operation, there was no statistically significant difference in sports and physical activities scores between the two groups at final follow-up. The difference between the Halasi and UCLA score could be due to the fact that the UCLA score was originally developed to measure activity levels following hip arthroplasty while Halasi ankle activity scale has been developed, especially for ankle pathologies. Our outcomes are in line with the results of other studies concerning return to physically demanding activities after TAR. Valderrabano et al. already showed a significant increase of sports' activity in patients undergoing TAR with mobile-bearing implants with excellent or good outcomes in 83% of cases and 69% of pain-free patients. The AOFAS hindfoot score rose from 36 preoperatively to 84 after TAR. They noticed a higher hindfoot score in sports-active patients than in inactive ones with hiking, biking, and swimming as the 3 most frequent sports activities practiced. Bonnin et al. reported that TAR improved patient's quality of life: 76% of the patients (in a retrospective series of 140 mobile-bearing TARs) valued their ankle as normal or nearly normal. They concluded that the return to recreational activities was possible while it was rarely possible in case of impact sports. In our series, 8 patients were able to return to high-impact sports despite being discouraged from medical staff (2 martial arts, 6 single tennis). In a recent survey of 173 AOFAS orthopedic surgeons, Macaulay et al. stated that most surgeons were comfortable with aerobic or low impact activities following TARs. Among the surgeons, there was disagreement with low boot immobilized sports; choice was usually based on the previous practice of the patient. High impact, jumping, and cutting disciplines were discouraged as well as poor bone quality, young age, and high body mass index led to more restrictive recommendations. In this study, skiing was one of the most practiced disciplines with good outcomes at 12 months of follow-up. In a recent systematic literature review, Horterer et al. stated that there is no evidence showing that the practice of sports' activities could be related with increased failure rate of TAR. They concluded that it remains debated whether ankle arthroplasty results in higher participation in sports. Although we only had 1-year follow-up, none of the patients of our groups underwent a revision surgery within the first 12 months postoperatively. In a study of 101 total ankle arthroplasty patients at a mean of 3.7 years, 62.4% of the patients were physically active before the TAR and 66.3% after TAR, but this improvement did not result statistically significant. Interestingly, in our study, the increase of sport-active participants after surgery was statistically significant in both groups. An important finding of their study was that the presence of periprosthetic radiolucencies did not correlate with participation in sports. This is consistent with the study of the survivorship of TAR in 684 patients using a 3-component design. The surgeons found that patients who were sport-active were not at higher risk for failure. In a retrospective analysis comparing TAR to ankle arthrodesis, the number of participants active in sport was stable before and after TAR. No significant difference was found in physical or functional outcomes following either ankle arthrodesis or TAR, even if participants of the total ankle arthroplasty group were more likely to attend highly demand activities. The main limitations of this study are the short follow-up and small sample. Other limitations are its retrospective nature and the lack of randomization of the groups. Further studies with longer follow-up and greater cohorts of participants are needed to confirm these short-term data. Patient expectations about ankle replacement have increased with many participants expecting to resume or even start physically demanding activities. Patients' expectations must be tempered by a surgeon's perceived risk of higher implant failure due to early polyethylene wear, aseptic loosening, or a periprosthetic fracture. In our study, the fix-bearing prosthesis had a more rapid recovery and better functional outcomes within the first 6 months after the operation. At 1 year, however, there was no significant difference in return to sport and physical activities between patients treated with a mobile-bearing implant and a fix-bearing implant. While we recommend against any high-impact or cutting and jumping activities, we still encourage routine aerobic exercise. Further studies on the longevity and complications of ankle arthroplasties and on return to specific physical activities after TAR are needed to reach guidelines based on stronger levels of evidence. Dr. Usuelli reports personal fees from Integra and Geistlich, grants and personal fees from Zimmer, outside the submitted work. Agel J, Coetzee JC, Sangeorzan BJ, Roberts MM, Hansen ST Jr. Functional limitations of patients with end-stage ankle arthrosis. Foot Ankle Int 2005;26:537-9. Deleu PA, Devos Bevernage B, Gombault V, Maldague P, Leemrijse T. Intermediate-term results of mobile-bearing total ankle replacement. Foot Ankle Int 2015;36:518-30. Saltzman CL, Zimmerman MB, O'Rourke M, Brown TD, Buckwalter JA, Johnston R, et al. Impact of comorbidities on the measurement of health in patients with ankle osteoarthritis. J Bone Joint Surg Am 2006;88:2366-72. Valderrabano V, Hintermann B, Nigg BM, Stefanyshyn D, Stergiou P. Kinematic changes after fusion and total replacement of the ankle: Part 2: Movement transfer. Foot Ankle Int 2003;24:888-96. Bonnin MP, Laurent JR, Casillas M. Ankle function and sports activity after total ankle arthroplasty. Foot Ankle Int 2009;30:933-44. Horterer H, Miltner O, Muller-Rath R, Phisitkul P, Barg A. Sports activity in patients with total ankle replacement. Sports Orthop Traumatol 2015;31:34-40. Macaulay AA, VanValkenburg SM, DiGiovanni CW. Sport and activity restrictions following total ankle replacement: A survey of orthopaedic foot and ankle specialists. Foot Ankle Surg 2015;21:260-5. Naal FD, Impellizzeri FM, Loibl M, Huber M, Rippstein PF. Habitual physical activity and sports participation after total ankle arthroplasty. Am J Sports Med 2009;37:95-102. Valderrabano V, Pagenstert G, Horisberger M, Knupp M, Hintermann B. Sports and recreation activity of ankle arthritis patients before and after total ankle replacement. Am J Sports Med 2006;34:993-9. Usuelli FG, Indino C, Maccario C, Manzi L, Salini V. Total ankle replacement through a lateral approach: Surgical tips. SICOT J 2016;2:38. Barg A, Knupp M, Henninger HB, Zwicky L, Hintermann B. Total ankle replacement using HINTEGRA, an unconstrained, three-component system: Surgical technique and pitfalls. Foot Ankle Clin 2012;17:607-35. Coughlin MJ, Saltzman CL, Anderson RB. Mann's Surgery of the Foot and Ankle. 9th ed. Philadelphia: Elsevier; 2014. p. 1127-8. Usuelli FG, Maccario C, Manzi L, Tan EW. 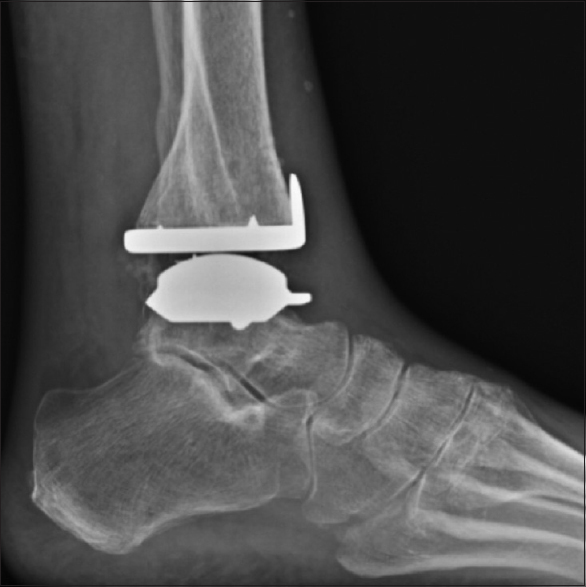 Posterior talar shifting in mobile-bearing total ankle replacement. Foot Ankle Int 2016;37:281-7. Chen CY, Huang PJ, Kao KF, Chen JC, Cheng YM, Chiang HC, et al. Surgical reconstruction for chronic lateral instability of the ankle. Injury 2004;35:809-13. Guyton GP. 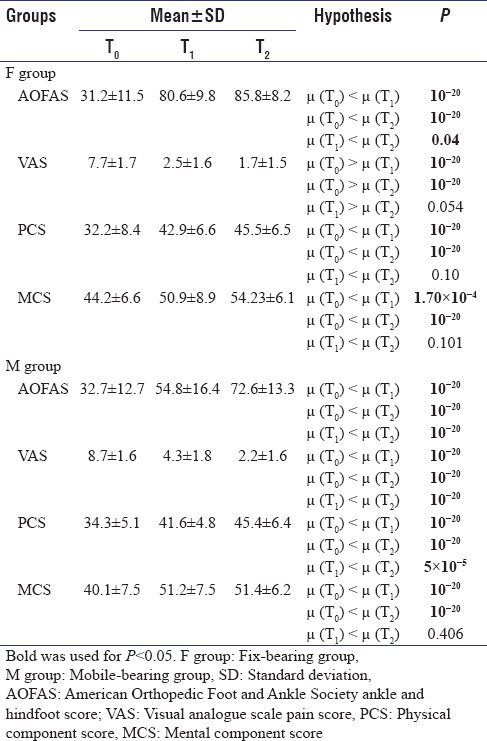 Theoretical limitations of the AOFAS scoring systems: An analysis using Monte Carlo Modeling. Foot Ankle Int 2001;22:779-87. Jenkinson C, Layte R, Jenkinson D, Lawrence K, Petersen S, Paice C, et al. A shorter form health survey: Can the SF-12 replicate results from the SF-36 in longitudinal studies? J Public Health Med 1997;19:179-86. Madeley NJ, Wing KJ, Topliss C, Penner MJ, Glazebrook MA, Younger AS, et al. Responsiveness and validity of the SF-36, Ankle Osteoarthritis Scale, AOFAS Ankle Hindfoot Score, and Foot Function Index in end stage ankle arthritis. Foot Ankle Int 2012;33:57-63. Halasi T, Kynsburg A, Tállay A, Berkes I. Development of a new activity score for the evaluation of ankle instability. Am J Sports Med 2004;32:899-908. Zahiri CA, Schmalzried TP, Szuszczewicz ES, Amstutz HC. Assessing activity in joint replacement patients. J Arthroplasty 1998;13:890-5. Cohen J. A coefficient of agreement for nominal scales. Educ Psychol Meas 1960;20:37-46. Hogg RV, Ledolter J. Engineering Statistics. New York: MacMillan; 1987. Valderrabano V, Pagenstert GI, Müller AM, Paul J, Henninger HB, Barg A, et al. Mobile- and fixed-bearing total ankle prostheses: Is there really a difference? Foot Ankle Clin 2012;17:565-85. Abdo RV, Wasilewski SA. 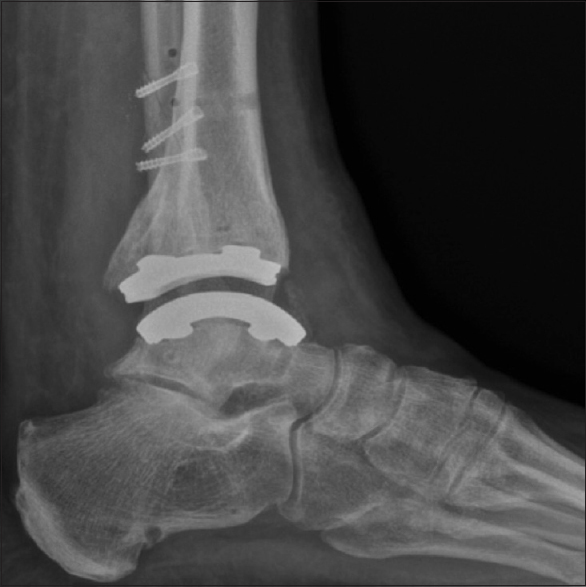 Ankle arthrodesis: A long-term study. Foot Ankle 1992;13:307-12. Gougoulias N, Khanna A, Maffulli N. How successful are current ankle replacements? : A systematic review of the literature. Clin Orthop Relat Res 2010;468:199-208. Haddad SL, Coetzee JC, Estok R, Fahrbach K, Banel D, Nalysnyk L, et al. Intermediate and long-term outcomes of total ankle arthroplasty and ankle arthrodesis. A systematic review of the literature. J Bone Joint Surg Am 2007;89:1899-905. Thomas R, Daniels TR, Parker K. Gait analysis and functional outcomes following ankle arthrodesis for isolated ankle arthritis. J Bone Joint Surg Am 2006;88:526-35. Valderrabano V, Hintermann B, Nigg BM, Stefanyshyn D, Stergiou P. Kinematic changes after fusion and total replacement of the ankle: Part 1: Range of motion. Foot Ankle Int 2003;24:881-7. Valderrabano V, Hintermann B, Nigg BM, Stefanyshyn D, Stergiou P. Kinematic changes after fusion and total replacement of the ankle: Part 3: Talar movement. Foot Ankle Int 2003;24:897-900. Chou LB, Mann RA, Yaszay B, Graves SC, McPeake WT 3rd, Dreeben SM, et al. Tibiotalocalcaneal arthrodesis. Foot Ankle Int 2000;21:804-8. Papa JA, Myerson MS. Pantalar and tibiotalocalcaneal arthrodesis for post-traumatic osteoarthrosis of the ankle and hindfoot. J Bone Joint Surg Am 1992;74:1042-9. Hahn ME, Wright ES, Segal AD, Orendurff MS, Ledoux WR, Sangeorzan BJ, et al. Comparative gait analysis of ankle arthrodesis and arthroplasty: Initial findings of a prospective study. Foot Ankle Int 2012;33:282-9. Saltzman CL, Salamon ML, Blanchard GM, Huff T, Hayes A, Buckwalter JA, et al. Epidemiology of ankle arthritis: Report of a consecutive series of 639 patients from a tertiary orthopaedic center. Iowa Orthop J 2005;25:44-6. Valderrabano V, Horisberger M, Russell I, Dougall H, Hintermann B. Etiology of ankle osteoarthritis. Clin Orthop Relat Res 2009;467:1800-6. Schuh R, Hofstaetter J, Krismer M, Bevoni R, Windhager R, Trnka HJ, et al. Total ankle arthroplasty versus ankle arthrodesis. Comparison of sports, recreational activities and functional outcome. Int Orthop 2012;36:1207-14. Tan EW, Maccario C, Talusan PG, Schon LC. Early Complications and Secondary Procedures in Transfibular Total Ankle Replacement. Foot Ankle Int 2016;37:835-41. Femino JE, Vaseenon T. The direct lateral approach to the distal tibia and fibula: A single incision technique for distal tibial and pilon fractures. Iowa Orthop J 2009;29:143-8. Lamothe J, Deland J, Schon LC, Saltzman C, Herbst S, Ellis S. Total ankle replacement through a lateral approach. Tech Foot Ankle 2015;14:69-78. Barg A, Zwicky L, Knupp M, Henninger HB, Hintermann B. HINTEGRA total ankle replacement: Survivorship analysis in 684 patients. J Bone Joint Surg Am 2013;95:1175-83.